I received a handful of messages from some friends he’d made over the years at work. It is so awesome to know that there are people who knew him even before I was born that still think of him, and took the time to send me messages or comment on this site. I want to post them all here and share them for everyone to see. Also, there were some comments on this previous post from some coworkers… please go read them. This first one is all the way from Taiwan, from a co-worker that had kept in touch with him for years after they worked together. I remember my dad talking about her, and I also remember that she would send Christmas gifts to my daughter and I’d always thought that was so sweet for someone to do that. I knew Horst from working at Lightolier. What a great person he was. He delighted our days at work. Horst will be remembered. I am the friend of Horst’s in Taiwan since he worked for Lightolier, then become a friend at Flickr. Horst told me a little bit about you, and his talent on photography was inspired from you. He is very proud of that. We have done a lot of great things when we worked together and I personally learned a lot from him also. We normally communicated thru Flickr, but lost since last month. I suddenly heard from his collegue yesterday that he was passed away few days ago and shocked. I was very sad to hear that and please express my condolence to your family. If anything I can do, please feel free to let me know. This interview popped up in the comments on the last photo in his stream. I remember reading this years ago… so glad the author (Angela Lobefaro) posted the link! My heart was filled with so much emotion, when I introduced JJ to Papa and mommy. I knew Papa was thinking about the photos he was going to take of JJ and he took some priceless ones. 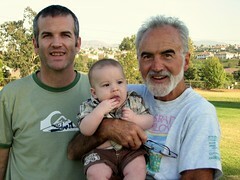 That is one thing I am going to miss deeply; my Papa, capturing the innocence of my son, his grandson, JJ in his photos. Some comments from the last photo in his flickr photostream. I can assure you that the family does read them all. I had to take a longer than expected leave from Flickr and am just finding out this sad news. Horst was one of my first contacts and a beloved member of this community. One of the best things that happened to me was stumbling upon Horst’s magical photo stream. He had an enthusiastic passion for capturing and creating the most unique images – the anticipation of each new post was consistently met with the satisfaction of yet another masterpiece. I posted this photo on my flickr stream a few days ago, and wrote about what it meant to me. I wanted to repeat it here; maybe expand on it a bit as well. 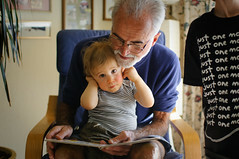 This photo here is special to me, perhaps even one of my most favorite photos I’ve taken of him… because it reminds me of my father reading to me when I was a child. When I was a young boy, I remember a tradition in our house at bedtime. My father would read us kids a story at bedtime. I’m not sure how long it actually lasted, but the times I do recall where from when I was between 7 and 10 years old. Now this wasn’t your typical story from a book, this was a story from an imaginary book. A comment from bdec on a photo that I posted. Horst inspired and encouraged me and any others with his creativity, humor and friendship. He will be missed. My sincerest condolences to you and the rest of the family. Your Dad was an amazing man – kind, talented, warm and funny. Sometimes these brief little statements say so much. horst is truly the master of all he surveys. his ‘sky magic’ defies compare. it is a sheer, and addictive delight, that a full grown being, with grandchildren–whom he adores–can continually fire up his imagination to entertain us with his mastery of all things seen through his lenses. horst takes the completely common in life, and extracts the essence of its most uncommon qualities and attributes. he adds a unique layer of magic to the mundane–inspiring the rest of us to endeavor to do the same. for me–and for many others i am certain–flickr is a more magical place with horst here. horst’s enlightened sense of humor inspires us to banter with him–in our photo streams–daily. thank you horst, and a special thanks to your handsome cast of characters and models who make marvelous guest appearances in your photo stream. an endless source of enchanting wonder. From this photo posted 32 months ago on flickr. Dedicated to hb19… I know these letters represent to best of Flickr… if you have been fortunate to receive a visit from this creative and talented “SHOOTER” you would understand where I’m coming from… His drive is inspirational… His comments are cherished… I don’t come close to his sky color or his signature style.